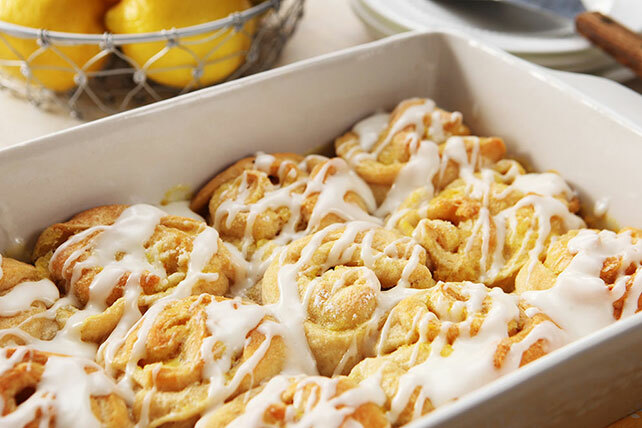 Skip the trip to the bakery with our Glazed Lemon Sticky Buns. Glazed Lemon Sticky Buns are a cinch to make and are served nice and warm from the oven. Unroll 1 can crescent dough onto work surface; firmly press perforations and seams together to form 12x4-inch rectangle. Brush with half the butter, then sprinkle with half the gelatin mixture. Roll up, starting at one short end; cut into 6 slices. Arrange, cut-sides up, in half of 13x9-inch baking dish sprayed with cooking spray. Repeat with remaining dough, butter and gelatin mixture. Bake 30 min. or until golden brown. Cool 5 min. Meanwhile, mix cream cheese, lemon juice and remaining sugar until blended. With their built-in portion control, these luscious buns make great treats. Place 1 roll on paper towel. Microwave on HIGH 15 sec. or just until warmed. Place piece of dental floss thread under the rolled-up dough. Bring the floss up around the dough and cross it over the top to cut through the dough and filling.